Waiting…it is something that we do everyday. We wait for water to boil, for red lights, for our children to wake up, or to go to bed, and if you live where I live you wait for trains (oh the trains…well, that is a whole different blog). Those are the little things, but we also wait for BIG stuff too. We wait for test results, a letter in the mail, to find out that we're going to have a baby and for the baby to FINALLY arrive. We wait ALL the time, every day. You would think that with all the waiting that we do in our life that we would do it better. You know the saying "practice makes perfect", well we do this all the time so we should be great at it. Unfortunately though, most of us are not. 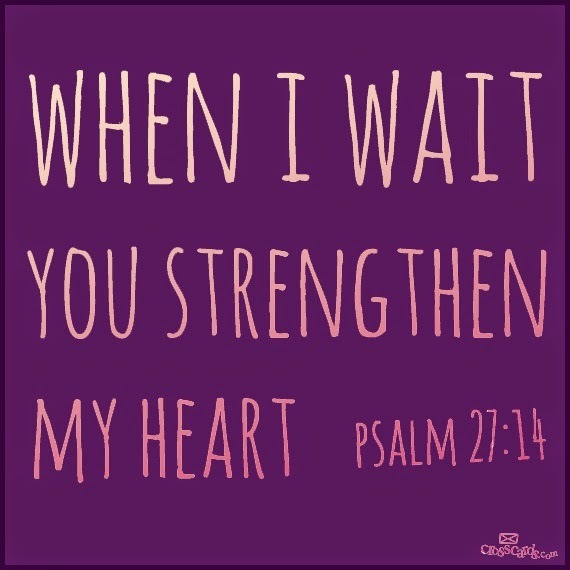 Because although we may "wait" I wonder if we are practicing waiting patiently. There always seems to be something that we are waiting for that pushes us to a limit of frustration and anxiety. Waiting tests our patience. Patience is the character trait that God is trying to work in us all the time. If we are going to be good at waiting we must practice patience in the waiting. It's like a muscle and it must be exercised every day in order to get stronger. I am convinced that if we will see God in the waiting that we will see Him working to grow us in our patience and in our trust of Him and His timing. I think that waiting can refine us almost as much as suffering can. If you are waiting for something and you are feeling anything but peace I encourage you to cast your eyes UP. Look to the Lord and see what HE is doing. Focus on Him, learn about Him, worship Him. Flex those spiritual muscles and be encouraged that if you exercise them they WILL get stronger. And since this is something we will do every day of our lives until we meet Jesus face to face getting better at will make our lives more peace-filled.